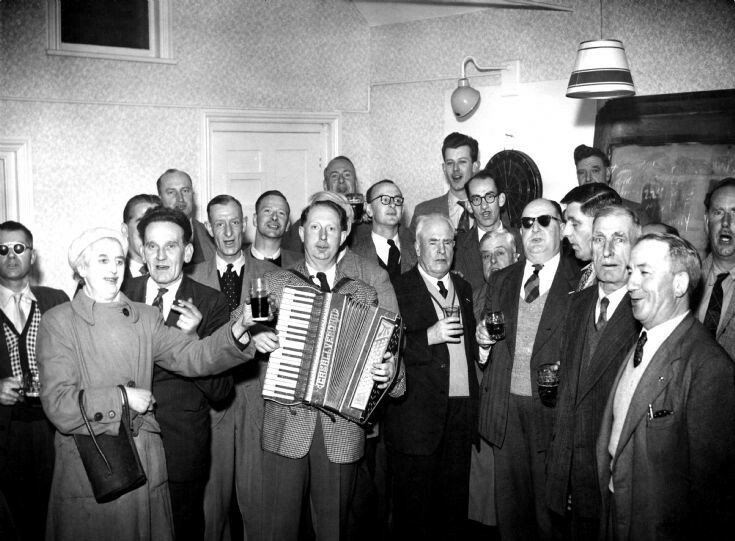 There are no details attached to this photograph, and I am guessing it is a British Legion reunion. I cannot recognise the location. Can anyone identify the pub, taking into account the layout of the bar, the position of the dartboard, and the fact that it seems to be a single storey building with a tie bar? Could it be in the single-storey extension added to the north side of the Grapes? The Large Version shows a numbered close up picture to assist in identifying the singing group. I can name only: 4 Tom Wilson (see below), 5 Sid Sargent, 6 Bert Knape, 7 George Hotten, 8 Ted Boniface, 11 Dennis Foord-Brown, 14 Rees Thomas, 15 Ebbie Robins, 18 Johnny Gratwicke, 20 Arthur Chamberlain. Please could anybody name some of the others? No 4 looks like Walter "Womper" Biggs who worked and lived on the Hyde estate. Jim Biggs confirms No. 4 to be his father, Walter Biggs, 12 Bill Stafford, 13 David Mitchell, 17 Jack Glover, 19 Bob Dench. No.10 could be Mr Cox, licensee of The Fountain. Location could be the Handcross Social Club before the first floor was added. The venue was the back room at the Red Lion, with St. Dunstan's dart team playing against the Red Lion. Dad (Arthur Chamberlain) was the captain of the home team. They played with 6" nails, by holding a piece of string from the bulls-eye to their nose. No 8, playing the accordian, is Ted Boniface, my Dad.